The Gazette published a great article today about the lack of transparency concerning the Flick shooting. (PDF Version) They also address the poor tactics used that led to Micah Flick’s death. It’s been over 7 months since Micah Flick was shot and killed during a botched felony arrest on February 5th. The next day Corrupt Sheriff Bill Elder during a press conference stated officers were wearing vests identifying themselves as law enforcement. From a Gazette article (Feb 6, 2018): All members of Flick’s team were in civilian clothes, as they typically are, but wore bulletproof vests identifying them as members of law enforcement agencies, Elder said. Immediately after the shooting, El Paso County Sheriff Bill Elder and Colorado Springs police spokesman Lt. Howard Black said officers were clearly identified by insignia. That has since been refuted by the 4th Judicial District Attorney’s Office, which said officers did not have their badges visible or verbally identify themselves until they were physically engaged with Zetina. We know many of them did not have vests on and all of them did not identified themselves as law enforcement (visibly or verbally) until they made contact with the suspect. 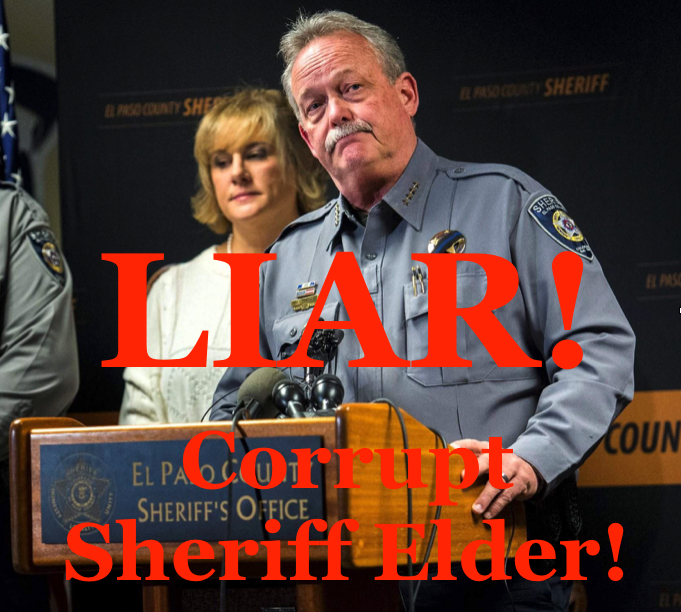 Corrupt Sheriff Elder has never told the public what really happened or admitted he lied. At this point it is clear it was Elder’s policies and poor leadership that led to Micah Flick’s death. It was Elder’s policy of having deputies write a memo every time they draw their weapon and encouraging them to keep their guns holstered that led to deputies attempting to arrest a felon with all their guns secured in their holsters. We have been told by multiple deputies they have been encouraged to leave their guns holstered. This allowed an individual to get off 7 rounds before anyone could return fire. Elder’s policy and poor leadership put deputies lives at risk. Hopefully Elder and his command staff have recognized their mistake and no longer give such direction to deputies. Had deputies approached Zetina with guns out and identifying themselves as law enforcement (LE) would he have pulled his weapon and started shooting; or would he have surrendered? We will never know. But why is Elder more interested in covering it up than being transparent and learning from it? Why can’t Elder just be honest? He owes the community an explanation and apology. In the same article from the Gazette (Feb 6), Elder went on to say; “I am proud, proud to be the sheriff of El Paso County today.” Really? It was Elder’s policies and poor leadership that led to Flick’s death and he’s proud to be sheriff? 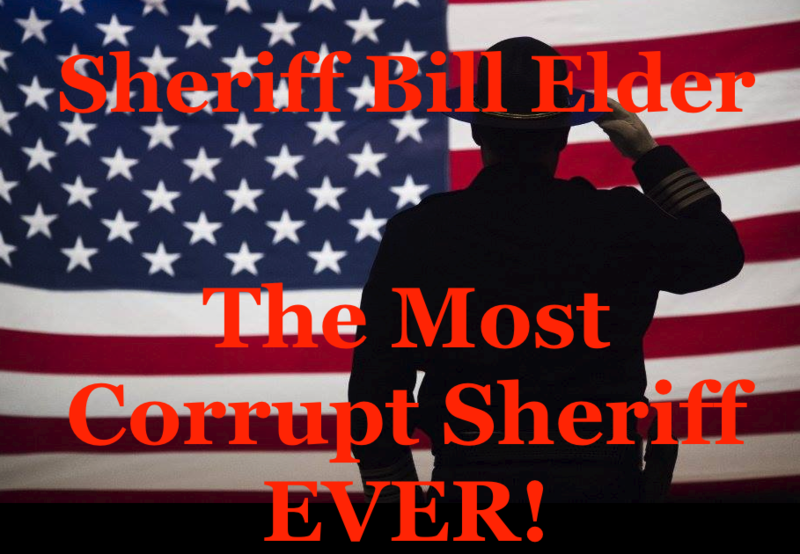 What should Corrupt Sheriff Elder be proud of? Being a liar? Being Corrupt? Being incompetent? The low morale? Having no leadership? His Cronyism? Having wasted millions of taxpayer money? Inappropriate behavior towards staff? Numerous lawsuits? Highest recorded attrition rate? Highest unsolved homicide rate? Placing deputies lives at risk due to understaffing in both patrol and detentions? WHAT EXACTLY DOES ELDER HAVE TO BE PROUD OF? HE IS THE PROBLEM; HE PUT THOSE DEPUTIES IN JEOPARDY WITH HIS LACK OF LEADERSHIP! Elder continues to use the tactic of deny, hide, and let it ride. Elder still has not admitted Deputy Juhl was shot by friendly fire during a shooting back in July. Deputy Jeremy Juhl, 36, a member of El Paso County SWAT, suffered a “slight” injury when he was struck by a pellet or shrapnel on his left side while exchanging fire with the suspect at a home in the 19000 block of Loop Road in eastern El Paso County, Sheriff Bill Elder said at a news conference at UCHealth Memorial Hospital Central. Corrupt Sheriff Elder made it sound like it was the shootout at the OK corral; it wasn’t. Elder continues to lie about this shooting as well. He has never admitted Deputy Juhl was shot with friendly fire and the suspect, who was killed, never shot his weapon during the shooting. Why can’t Elder just be honest? Who will hold Corrupt Sheriff Elder accountable?